Use Page Break fields to create multi-page forms. Users may easily navigate back and forth between the pages. If you would like to create a multi-page form, the Page Break field is all you need to break the form into pages. A Page Break marks the division between pages. Simply add a Page Break field anywhere that you want a new page of your form to begin. The text on the Page Break field will be used for the 'Next' button in the form. 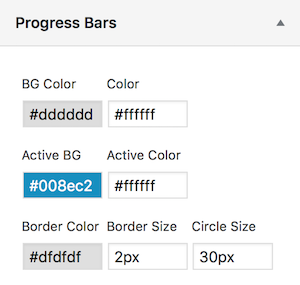 Progress bars help users see where they are in the form. Additionally, your users can jump to different pages by interacting with the progress bar. Follow the steps below to add a progress bar to your form. Create a multi-page form or open an existing multi-page form. Go into the Form Settings and set the Pagination setting to Show Progress Bar. You can optionally adjust the Page Titles, hide the Page Numbers, or hide the Pagination Lines. We recommend checking the box titled Show page titles with steps and label your pages. This helps users know which page they are on when looking at the progress bar. A rootline can help users see where they are in the form. Additionally, your users can jump to different pages by interacting with the rootline. Follow the steps below to add a rootline to your form. Go into the Form Settings and set the Pagination setting to Show Rootline. You can optionally adjust the Page Titles, hide the Page Numbers, or hide the Pagination Lines. We recommend checking the box titled Show page titles with steps and label your pages. This helps users know which page they are on when looking at the rootline. 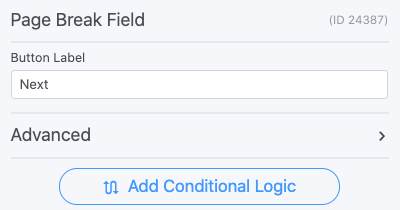 Add conditional logic to a Page Break in order to show or hide the following page depending on a selection in the form. You may set up your form so a single page or multiple pages can be skipped conditionally. Customize the text that will be shown on the Next and Previous buttons. If you would like to change the text on the Next button, click on the 'Next' button in the page break field and insert the text there. If you would like to change the text for your Previous buttons, go into your form 'Settings', and scroll down to 'Styling & Buttons'. In the 'Previous Button Text' box, insert your custom text. By default, your Next and Previous buttons will match the styling of the form's Submit button. You can style your Previous button manually by following these styling instructions. If you have both the previous and next button on the same page in a multi-page form, hitting the enter key after making an entry will trigger the previous page function instead of the next page. Note: This customization will move the previous button after the Next/Submit button in the DOM tree. You can change "Save" to whatever word(s) you want to show in the button. A multipage form can save automatically when switching between pages when saving drafts is enabled. Read more about allowing logged in users to save drafts. Show all fields on the final page of a multi-paged form with the frm_get_paged_fields hook. Remove page breaks from the admin with the frm_get_paged_fields hook.